The mini downhill series is now in it’s 10th year. 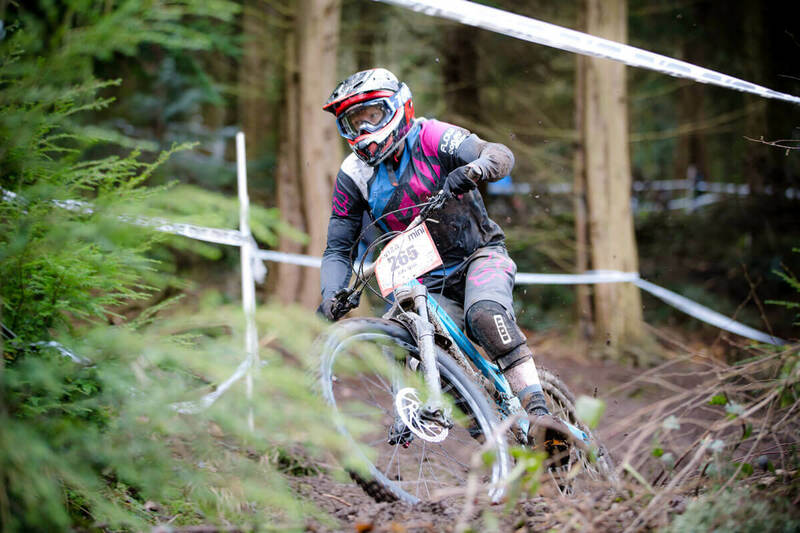 On a wet Sunday morning in February on a track slippery enough to test any rider Kate joined 19 other women entered across 4 race categories, here’s her race report. Just a week after taking part in the Racers Guild at Cannock in the Midlands I was heading south to the Forest Of Dean for the 3rd round of the Onza Mini Downhill series. I was rather excited as the atmosphere between the girls is fantastic, lots of banter great encouragement and basically it’s just a ball! There are some great riders taking part in the Mini Downhill and I’m always welcomed to join them for practice and just general shredding, I already feel like I’ve come on leaps and bounds since my first race in December. Sometimes it does you good to throw yourself in at the deep end and just “go with it”. Yes it may scare the living daylights out of you at the time, but I know for sure I wouldn’t be tackling some of the technical tracks the Forest of Dean has to offer. This brings me onto the track to be used – Endo! Endo starts at the top with a narrow twisty section, you can get a really good pump into the shallow bends to gain speed. A steep chute spurts you out onto the fire road and you kinda have to make an S shape to ready yourself for the next part of the track and this is where Endo gets really nitty gritty! Roots, switchbacks and lots of trees and stumps to avoid as your negotiating these features! I stood at the top of the last rooty corner in practice, I was thinking how on earth would you even walk down that, let alone race down it! As you head towards the end of the track, the course opens out from the trees into the fast section and its like a playground – table tops, a small step down and a road gap to finish. Now add rain and a tonne of mud = carnage! And although a tad scary also quite fun! It’s certainly made for some cracking pictures! I’d met up with Flow and my team mates to be given my rather plush looking race kit – wowsa! Pukka isn’t the word! The team got suited and booted and pedalled off to shred some tracks together, we had such a great time and I felt it set me up nicely for my practice and race the next day. I don’t know if you would call my practice runs a ‘run’ or a ‘slide drifting’ sounds pretty cool though! I ended up flat on my back between spectators waving down at me and those root corners were really wild! I decided to shoot down to Pedel a Bikeaway shop and grab a Magic Mary mud tyre to help plant the front tyre as the trail tyres were having a hard time! The mechanic was a great help and had me ready to go and get a final practice. I made my way back to the top of the track and set off down the track only to be floored by a log on the edge of the track, it took the bike and my thigh clean out, I was eating dirt! I plucked up the courage to take a look at my thigh and quickly decided it was best to ignore the state of it as run 1 of the race was about to start!? Feeling quite nervous not getting a quick pratice with my new tyre and pondering over my tyre pressure I waited at the start line, listened to the beeps and watched the time counting to start me off! I went out of the blocks with caution and pedalled into the first corner – it wasn’t long until I got that pumping flow and I was spat down onto the fire road – dabbing at the brakes my back end squirming around in the mud I did take my time to line myself up for the rooty section. I rode down into the roots with caution and a little too rigid on the bike. I remember telling myself to let the bike move and go with it but sometimes it’s easier said than done! Making my way through the roots and switchbacks enjoying the encouragement from spectators the bike was sliding around but I was managing to stay rubber side down. I came to the clearing and the ride of the track felt completely different. I’d gone from a slippy roll with an uncontrollable front tyre to cloggy speed sapping – I pedalled hard through the table tops, over the step down and hit the road gap. You always know you’re at the finish as you’re greeted by the excitable cheer from the rest of the girls 🙂 I love that feeling at the finish line meeting back up with the rest of the team to join in cheering the pack home! I was sat in 7th place and was chuffed I’d made a clean run down although I didn’t hit all my planned lines. My second run I was determined to hit my lines and let the bike loose under me more and that’s exactly what I did scrubbing two seconds off my first run I was still sat in 7th! All the girls who took part rode brilliantly along with healthy competition and bags of fun it made for a great day! Thanks to my sponsors Flow MTB and my team mates for their support especially during the tough race conditions and for the kit and protection supplied – I hardly recognised myself on the pictures, looking fab! A great event as always and a credit to the organisers. Bring on the next round!